August | 2017 | Mike Lamberti, From Margate To Cleveland, And Back ! 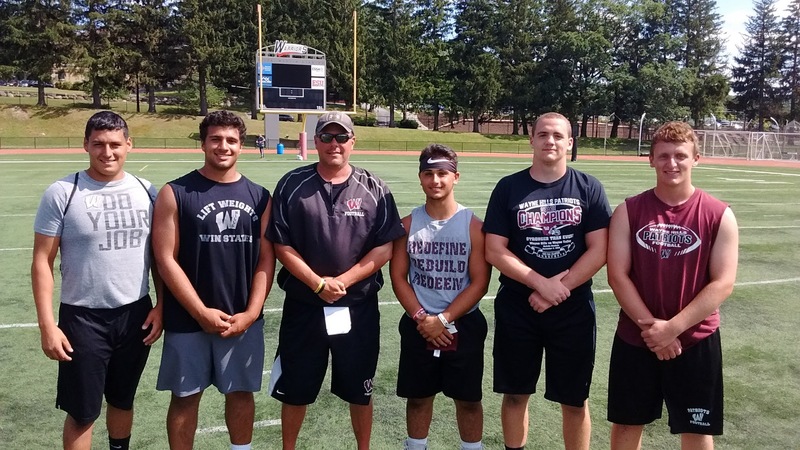 Wayne Hills had just completed its last home practice on Aug. 29, before preparing for a trip to Canton, Ohio, for the Patriots’ season opener, on Sept. 1, against Canton McKinley High School. Head coach Wayne Demikoff explained, with the heavy travel planned, starting on Aug. 30, practice time leading up to the game on Sept. 1 would be limited. The Patriots bus is scheduled to depart Wayne Hills High around 7 a.m. on Aug. 30. The players are expected at school by 6 a.m. to complete the final preparations and loading the equipment van, which assistant coaches Mike Zaccone and Matt Bogert will be driving out to Ohio. The first stop, en route to Canton, is a 225-mile ride to Penn State University, where the team should arrive around 10:45, or so. There, the Patriots will practice, visit the college, then have lunch. After Penn State, it’s back on the bus, this time for a 175-mile ride to Youngstown State University, in Ohio. After visiting Youngstown, the team heads to its hotel in Canton, near the Pro Football Hall of Fame, where Hills will play at the legendary Tom Benson Stadium on Sept. 1. That trip will take about an hour. 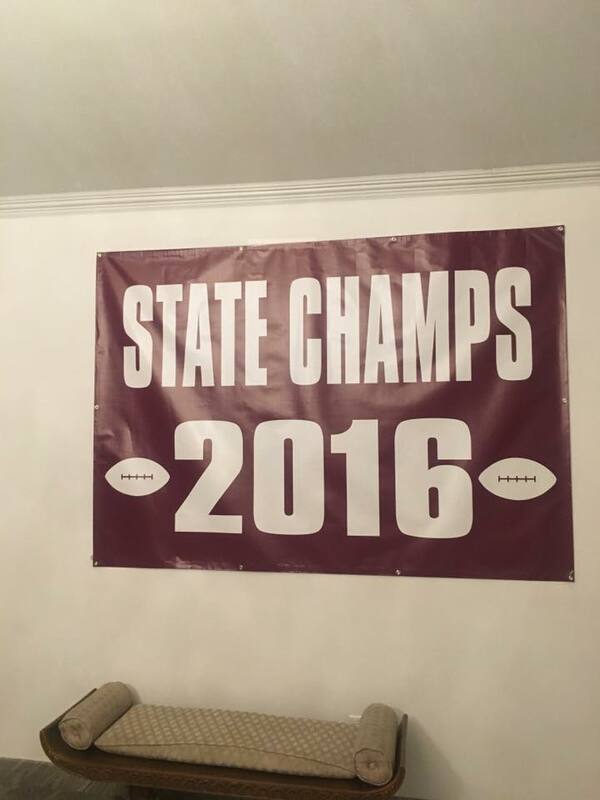 Wayne Hills will add its ninth state championship banner to its fence of fame this fall. (Click on photos for larger images). “It will be about a nine-hour day,” said Demikoff. On Thursday, the team will have breakfast at the hotel, visit the Pro Football Hall of Fame from 9 a.m. to noon, followed by lunch at the prestigious Gold Jacket room, from 12-1. The Patriots will practice at the University of Akron, in the afternoon. 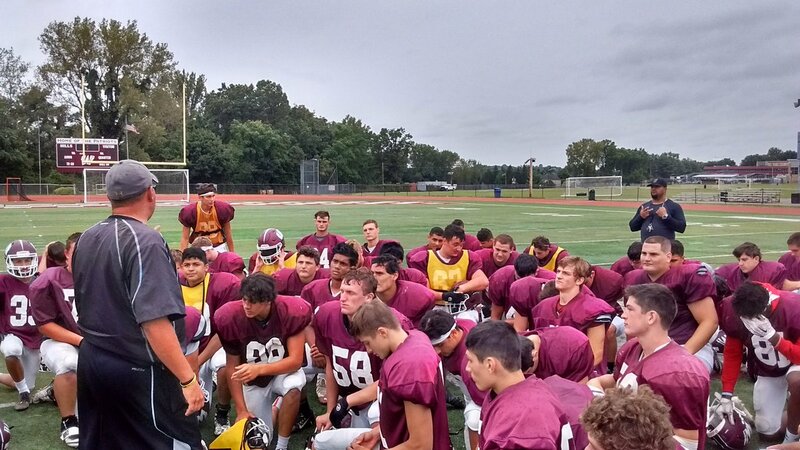 That evening, the Wayne Hills JV team will play Canton McKinley’s JV, at 6:30 p.m., at Canton McKinley High. And finally, on game day, there will be a walk through at Kent State University, then it’s off to the newly renovated Tom Benson Stadium, for what should be a charged up atmosphere against Canton McKinley, which plays most of its home games at Benson Stadium. In fact, Canton McKinley opened its season last week, with a 29-7 win, at Benson. While the travel should be a great experience for the players, Demikoff has been quick to note that this is game week. And the Patriots, coming off a 12-0 season in 2016, are traveling to Ohio to play a tremendous team, with the only expectation to win the game. The preparation time is long for the coaches. Demikoff has been up until 3 a.m. the past few days, working on game plans and watching film. Following practice on Aug. 29, he and assistant coach Mike Kelly, were working on game plans while the players received an update on good nutrition and the proper food to consumer on the trip. Demikoff’s coordinators, John Jacob and Jermain Johnson, have also logged in long hours, as has Zaccone, the special team’s coach and Mike Peischl, who is a key offensive coach. Other coaches, like Chris Dowling, have been doing the logistical work for the trip. Tony Giampapa, Anthony Giampapa and Walt Johnson were scheduled to fly to Canton ahead of the team’s arrival, to get everything set at the hotel. Pat Cosgrove, Hills’ long-time assistant coach, will fly to Canton on Aug. 31 to join the team in time for Friday’s game. Just getting out of the parking lot at Hills is an adventure. There are the permission slips that all the players needed to complete, the packing of all the equipment, checking the players to make sure everything required was packed, as stipulated. The Wayne Hills cheerleaders will also be traveling to the game, but they’ll be on different buses. The young ladies will meet the team at Penn State for lunch and, of course, will cheer on the team this Friday night. And, of course, there will be plenty of parental support at the game, as a number of the player’s parents will travel to Ohio for the game.